The Fine Gael/Labour government is in crisis. The election results of recent days confirm this. They have been effectively given a notice to quit by the electorate. Fine Gael and Labour came to power in 2011 promising an end to cronyism and greater transparency and accountability. 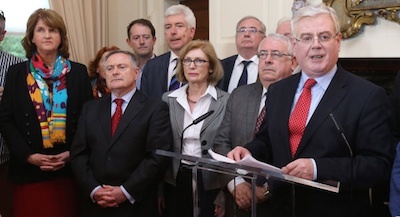 It was proclaimed by Enda Kenny as a ‘democratic revolution’. Three years later it’s looking more and more like the same old, same old. Enda Kenny and Eamonn Gilmore have lost control of the political agenda. For months they have been denying that there is any crisis in health, especially in respect of the removal of discretionary medical cards, or that there is a growing problem with housing, and especially homelessness. They also consistently and robustly defended the actions of their former Justice Minister Alan Shatter, even as the scandals in policing and justice increased, and public disquiet turned to anger. The treatment of the two Garda whistleblowers, John Wilson and Sergeant Maurice McCabe by the government was appalling. The government’s attack on the Garda Ombudsman’s Office (GSOC) over allegations of bugging was disgraceful. The then Justice Minister’s instinct was to put GSOC in the dock. But it was Alan Shatter’s judgement and his decisions, on a whole range of serious justice and policing issues that has undermined public confidence in the administration of justice and the Gardaí. It led to the sacking of the Garda Confidential Recipient Oliver Connolly and the sacking/retirement of Garda Commissioner Martin Callinan. Then the news broke that telephone calls into and out of over 100 Garda stations had been bugged for years. A commission of investigation was set up to examine this. In a desperate attempt to limit the political damage Minister Shatter belatedly apologised to the Garda whistleblowers. Fine Gael and Labour backed him to vote down a no confidence motion in the Dáil. But the report from the Data Protection Commissioner in early May that Justice Minister Alan Shatter broke the date protection rules by revealing personal information about independent TD Mick Wallace in a television debate; and the then imminent publication of the Guerin report into allegations made by Garda Sergeant Maurice McCabe, saw Alan Shatter resigning as Minister for Justice. But bad as all of these debacles have been it has been the withdrawal of medical cards, especially from children with lifelong illnesses or disabilities that has caused the greatest public anger. Almost every day another tragic story emerges of a family being put under pressure with the removal of their medical card or the threat to remove it and deny a sick child much needed medications and support. Amanda Hughes spoke out last week about being asked to prove that her son Ben, aged 4, ‘still has Down syndrome’ if he is to keep his medical card. Joe Lawlor’s daughter Nathalia has a rare incurable genetic condition who is asked each year if his daughter still has the condition. Nathalia can’t walk or talk and is fed by a tube and needs 24 hour care. The Irish Cancer Society has also described how many cancer patients are suffering severe distress and financial hardship as a result of losing their discretionary medical cards or being refused these cards. It says that it has seen a 12% increase in applications for financial aid from patients in the first three months of this year. Time after time under questioning by me and others in the Dáil Enda Kenny and his Cabinet colleagues, but especially the Minister for Health James Reilly, defended their handling of the discretionary medical cards issue. Last October the Taoiseach described the row over cuts to medical cards as “scare-mongering”. He insisted that “every person who deserves a card” is getting one. He and the government did the same around the issue of housing and homelessness. And then, low and behold, just days before an election in which the pollsters said that the government parties were heading for losses Ministers suddenly discovered their consciences. A report on homelessness was produced, a new state bank to help small and medium businesses was announced and on Tuesday last, just days away from citizens casting their votes the Health Minister said that is no longer acceptable for “some of the most vulnerable people in our society” to be stripped of state help. The Labour Leader too sought to blunt the criticism of the government by acknowledging that the implementation of too many checks on those with medical cards, in particular those over aged over 70, is a form of ‘harassment’. The government claim action will be taken. Exactly what action the Taoiseach and others envisage we don’t know. They wouldn’t say. But trust them, there will be action. We just have to wait until after the election. And God forbid that anyone should suggest that this is just an election stunt. For three years the Fine Gael/Labour government has been inflicting one hardship after another on vulnerable citizens to pay for the greed of the bankers and developers and corrupt politicians. A succession of stealth taxes, including sceptic tax charges, the universal social charge, the property tax and now water charges have all been introduced. The EU and local government elections have allowed the public to pass judgement on this government. It should go. That would be the right thing to do. But in the expectation that Fine Gael and Labour will once again not do the right thing we begin fighting the next Dáil general election now.